Increasing the value of your home through skilled craftsmanship. 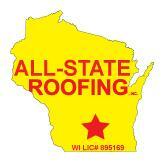 All-State Roofing, Inc. is a Dane County family owned and operated business. We have over 37yrs of experience as roofing contractors right here in Madison, WI. Some of the services we offer are hail & wind damage repairs, roof replacements, siding replacement, window replacement, gutter replacement, soffit & fascia replacement, flat roof replacement, roof coatings and new construction installation. Click on any of the items below for more information about that service, or pick up the phone and give us a call: (608) 271-9810. Soffit & Fascia will put the finishing touch on your home's exterior.